Of all the Spotted Peccary releases to date, Continuum is by far the most dense, lush, and intensely symphonic. The material seems to focus on the essence of life, self-realization, and inner discovery. 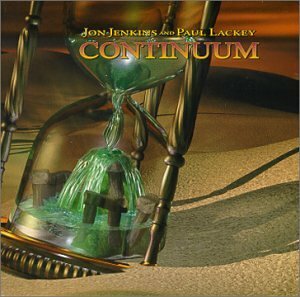 The compositional style reflects Jenkins’ and Lackey’s experience in soundtrack work, as most tracks are a journey from point A to point B, with little regard given to traditional structures. A few of the pieces, like “First Breath,” are a little leaner on the orchestration, yet still follow a similar approach in form. “The Vision,” embellished by flute courtesy of Teeto Cheema, perhaps points to some possible influences – most notably Tangerine Dream, and some of the late-80s artists on the IC label like Mind over Matter. Following a more dark and mysterious path is “A Relic’s Tale,” which features the album’s most overt use of drums and other percussion, drifting through patches of warm symphonic sunlight along its way. “Adrift” is a gentle pulsating fantasia that starts quietly and blossoms with power, then declines with a touch of guitar added. The closer (and title track) is another impressionistic dreamscape of symphonic proportions, with main theme and variations flowing effortlessly toward the climactic conclusion – which fades down to the same sound that started the album, a bit like turning over the hourglass on the booklet cover. All I can say is that this one hasn’t been out of my changer much since it arrived.